If you’ve ever needed to display a number written out as text, you probably discovered that Excel does not offer such a function. When Excel fails to deliver, it’s often possible to correct the deficiency by using VBA. 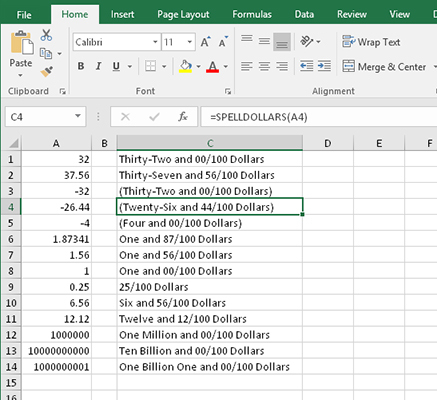 Here’s a VBA function, named SPELLDOLLARS, that you can use in worksheet formulas. Here are some examples of SPELLDOLLARS. To use this code, press Alt+F11 to activate Visual Basic Editor. Then choose Insert → Module to insert a new VBA module. Copy the code and paste it into the new module. ‘  Is it a non-number or empty cell? ‘  Is it too large?